Note 4/4/2009: This is an April Fools Day Story. I'm so excited to share with you a recent interview I conducted with marketing expert and famous author Seth Godin! Mr. Godin was kind enough to make a trip to the Global Headquarters of MineThatData and graciously share his thoughts on the changes occurring in what we affectionately call the Multichannel Marketing (aka Catalog) industry. So today, April 1, 2009 (ahem), I share "the interview" with you! Kevin: Mr. Godin, thank you so much for making the trip to the MineThatData Global Headquarters. Seth: Nice to be here, Kevin. I'm a big fan of the work you're doing with Multichannel Forensics. Are these heated leather floors we're standing on? Kevin: Have you ever shopped from a catalog? Seth: Absolutely. I've always enjoyed the Garrett Wade catalog. The best catalogs are the ones that made it through "The Dip". If you want a German-Made Sodbuster Knife, you know that the Garrett Wade catalog will have it. They understand who their target audience is, and their relevant and timely e-mail messages inform me of needs I didn't even know I had. Kevin: What do you think of the catalog industry, not the catalog industry of 1989, but the catalog industry of 2009? Seth: Like many industries, the catalog industry is being transformed by the internet. This is good for customers. Customers have more choice than ever before, and customers have access to the best prices. Kevin: But this isn't always good for catalogers. The productivity of catalogs, especially those sent to customer acquisition segments, is declining, rapidly. Seth: I always say that "the new thing is never as good as the old thing". Catalog brands had a spectacular run alongside the baby boomers, and had huge advantages over retailers. The catalog brand "knew" who their customer was, sending timely, targeted, and relevant messages to enthusiastic customers. Catalogers, in many ways, invented Permission Marketing. But the old thing (catalogs) are going away, and what we're replacing catalogs with (e-mail, websites, blogs, social networks, search, tribes) simply aren't as good yet at creating demand. Kevin: Why do you think that the old thing, the catalog, is going away? Seth: Catalogs used to be the best vehicle to provide targeted, relevant, personal messages. As a result, the catalog industry built huge systems. An entire list industry grew to support catalogers. Printers, paper reps, the USPS, merge/purge houses, they all evolved to support the delivery of the most targeted, relevant, and personal messages that ever existed. And that worked well, for a period of time. But the system didn't deserve to last forever. The cost structure associated with this huge system is unsustainable. The system is being replaced by three separate but powerful dynamics. Kevin: And those dynamics are? Seth: First, a customer can receive a personalized message via e-mail or RSS that costs the cataloger nothing to send. Each catalog costs, what, $0.75 to deliver to a customer, with a whole bunch of intermediaries taking their $0.10 of the pie? The economics are no longer sustainable when a competitor can send a personalized, relevant e-mail campaign that the customer opted-in to receive. The customer has some control over e-mail delivery, and has complete control over content via RSS. Look at your business, Kevin. You have almost 2,000 subscribers, and you spend absolutely nothing acquiring subscribers, do you? And yet, those 2,000 subscribers pay your mortgage for you. Kevin: But e-mail marketing might generate only $0.15 per e-mail delivered, while a catalog might generate $3.00 or $4.00 per catalog. So the new style of marketing isn't "working", if you will. Seth: The new thing is never as good as the old thing. Seth: Second, the customer is now in charge. In 1989, the customer shopped from distance only when she received a catalog. In 2009, the customer determines when and how she wants to shop. The catalog marketer must make the transformation from pushing merchandise at the customer to allowing the customer to pull information when she has a need. This is maybe the hardest thing for a cataloger to do --- to transform from pushing messages to facilitating the pull of information. Kevin: It's especially hard when the cataloger is going through a customer acquisition death spiral. Seth: And that brings me to my third point. The cataloger always controlled the start of a relationship, by renting lists from and exchanging lists with competitors. That strategy worked in 1989. But in 2009, the customer demands control over the relationship, and she's not going to tolerate receiving a catalog in her mailbox that she didn't ask to receive. The future demands that the cataloger be a "leader of a tribe", if you will. Kevin: Describe what you mean by being a "leader of a tribe"? Seth: Instead of renting names and addresses, the cataloger will transition to the role of a tribal leader. The Garrett Wade marketing role will evolve, speaking to an individual who lives a lifestyle that demands a Japanese Pattern Crosscutting Timbersaw. Garrett Wade identifies a group of individuals who have common interests, providing the tools needed for tribe members to achieve their potential. The tribe partners in the marketing role with Garrett Wade, they invite individuals to join, individuals who share common interests. Kevin: But that sounds like a lot of work. Seth: It is a lot of work! Kevin: So here's the problem. The catalog brand has numbers that they need to hit, now, in order to keep people employed. What you're talking about sounds futuristic, esoteric, theoretical, almost unachievable. Seth: I always say that "The best time to change your business model is while you still have momentum". Catalogers still have momentum. And it isn't easy to give up the idea of sending catalogs to a mass audience that doesn't have choice. Get over it! While you think about a different business model, folks like Zappos successfully apply a different business model. It might be the only option if the catalog industry wants to stay in business, long-term. Kevin: Our time is almost up. Do you have anything else you wish to share with the catalog industry? Seth: I'd tell the catalog industry to make things happen. Take initiative! You practiced permission marketing before permission marketing was popular. You have a virtually endless number of channels to practice permission marketing in today, and you have loyal customers who are waiting for you to lead them into the future. So lead them there! Kevin: Mr. Godin, thank you so much for taking the time to speak with the MineThatData "tribe". You can do a hundred good things at work. And then, something happens, and you feel like a fool. You remember feeling like a fool for years, maybe decades. At Lands' End in 1995, I selected the best 1.3 million names for a catalog mailing. We were supposed to mail the best million households, and leave 0.3 million as a contingency. I sorted the list in the wrong order, mailing households 0.3 to 1.3 million. Ooops. You know you made a mistake when the catalog is in-home for two days, and is 40% below plan. The merchants, your CEO, and your boss are all very interested in finding out why the catalog is failing. After I found the error, I had to fess-up. Fun stuff. We sent out another 300,000 catalogs to make up the demand --- so my sin only cost my company $150,000 of profit. A similar problem happened at Nordstrom in 2004. We mailed something like 3 million folks a 124 page catalog, and 3 million folks a prospect catalog, 64 pages --- the best customers were supposed to get the bigger version. Two days after the in-home date, we observed a problem ... the big book is -50% to plan, the smaller book is like 80% over plan. Oh, if you want to see inventory managers get frustrated, go ahead and switch customer lists sometime! One of my executive team peers told my President that s/he "wanted blood". This person wanted to know the name of the individual working in my department who made the mistake. I admitted the mistake of my team to our entire direct-to-consumer division and marketing division via e-mail, I apologized. I didn't give up the name of the person to this executive --- I did tell my President and my CMO. You cannot offer enough blood to an executive who thirsts for it. You find out who is on your side when you make a fool of yourself. And honestly, there's value in that, right? We all make mistakes. Some are public, some aren't. Today's a good day to think about being more tolerant of the fools who make mistakes. Give this a read. Today's catalog is a lot like an album, isn't it? And the references to video games and the iPhone are interesting to take note of. The album has a dozen or more songs from an artist, and comes out once every "x" years. We all know that only one or two of the songs are exceptional, so we go online to find what we want. Catalogs have a hundred pages, and come out once every "y" weeks. We all know that only one or two of the items are what we want, and then we go online to comparison shop and ultimately make our decision. The internet is obliterating tradition. After being on the wrong side of a technology shift at Nordstrom in 2004, I vowed to do my best to not be on the wrong side of technology again. We're locked in a fascinating shift from profitable channels to popular channels that are hard to monetize. 23% = Shopping Comparison Sites. 7% = SMS / Text Messaging. 3% = TV / Newspaper / Radio. Obviously, this poll isn't scientific, it only represents what 1.5% of this audience thinks. And yet, the shiny new toys (Twitter, Facebook, Blogs, Mobile) are not channels you'd spend money in. Nor are traditional tools (catalogs, direct mail, TV, radio, newspaper). Nope, you'd invest in e-mail and paid search. And yet, CEOs are always telling me about two fundamental truths. E-Mail marketing has unlimited potential, but never achieves it, yielding $0.15 per e-mail when done with little effort ... yielding $0.25 per e-mail when executed in a targeted, personalized manner. Paid Search doesn't scale ... you "max" out your opportunity --- online CEOs are all looking to "detether" from Google. So what is it? Are these the places to invest money because of their own inherent potential, or are the alternatives poor performers? Have you had a chance to review any of the presentations from the recent NEMOA conference? OMG, as the kids and social media experts say, what a refreshing array of content! Great job Janie Downey! Bill LaPierre of Millard, with a must-read on cataloging, absolutely awesome! Monica Smith on the mind of the multichannel customer. I've only met Monica once, she's a very bright individual. Mike Bowcut of REI shares a fantastic presentation of stuff he's learned at REI, a reasonable and professional and well-argumented discussion of the role a catalog plays in marketing. Give all of the presentations a chance. These discussions lead us into the future. Think about cataloging in just five years, say in 2014. It is likely that the circulation plan for a catalog marketer in 2014 will look very different than the circulation plan looks today. Catalog (128 pages) in-home on 4/1, mailed to 300,000 housefile names and 500,000 prospects. Catalog remail of the 4/1 catalog (128 pages) on 4/15, mailed to 200,000 housefile names and 150,000 prospects. Catalog (96 pages) in-home on 4/1, mailed to 100,000 housefile names and no prospects. Catalog (32 pages) in-home on 4/15, mailed to 150,000 housefile names and 100,000 prospects. How will we acquire enough new customers to offset the 550,000 reduction in customer acquisition circulation? How will we offset the sales lost by a reduction in housefile circulation of 450,000? The answers have been discussed this week. It's time for us to get busy testing! And worst/best of all, there aren't any easy answers. You are telling me that you want solutions, things that work today, now! Unfortnuately, it isn't going to work that way. The online companies ask me to find ways that you can acquire customers offline. Catalogers ask me to find ways to acquire customers online. The only common theme is that it is becoming very hard to acquire new customers. Going forward, acquiring new customers is the primary responsibility of a direct brand. The cataloger of 2014 becomes a media company. There's no reason to view Crutchfield any different than Martha Stewart. The multichannel view of the world is replaced by the micro-channel view of the world. The lines between merchant, media brand, and community developer blur. A catalog is just one of hundreds of micro-channels that in sum make up the "Crutchfield" brand. That's a future that is actually exciting, a future where a catalog brand isn't dependent upon catalogs for growth. Many catalogers spend way too little time thinking about e-mail marketing. The modern catalog marketer views the world in a different way. The modern catalog marketer actively tests varying combinations of catalog mailings and e-mail campaigns to comparable audiences. These folks (those who execute the tests) frequently learn a secret --- e-mail marketing is a much stronger marketing channel when catalogs don't exist. In the rapid segmentation process, the modern catalog marketer wants to quickly assign customers into the "digital marketing" path. These customers see a reduced diet of catalogs, with the cataloger attempting to make up some of the volume with inexpensive e-mail marketing campaigns. It doesn't always work out this way, but you have to run the tests, don't you? The modern catalog marketer uses tools like e-mail to introduce new items without having to spend money on expensive paper to subsidize awareness. The modern catalog marketer realizes that a lack of an e-mail address results in a more likely assignment into the "traditional marketing" segment. The modern catalog marketer has between five and twenty different versions of an e-mail campaign, assigning different customers to different versions. The modern catalog marketer uses clickstream data (i.e. what the customer looked at), merchandise purchased, recency/frequency/monetary, and customer preferences to determine which version of an e-mail campaign the customer receives. The modern catalog marketer does not measure e-mail campaign success by open rates, click through rates, or conversion rates. The modern catalog marketer evaluates e-mail performance based on the change in annual retention rate, and change in annual customer profitability, caused by e-mail marketing. The modern catalog marketer is very willing to deliver a month's worth of e-mail campaigns that do not sell a single item. Conversely, the modern catalog marketer actively plans the sales per e-mail at a customer segment level, planning these metrics months in advance. The modern catalog marketer is willing to accept $0.05 per e-mail delivered without a promotion, and is willing to forgo $0.15 per e-mail delivered with a free shipping or %-off offer. The modern catalog marketer lets the customer determine contact frequency. The modern catalog marketer gives the e-mail department a seat at the leadership table. The modern catalog marketer knows exactly how much of paid search expense is caused by e-mail marketing, and blends that aspect of paid search expense (and conversion) into the e-mail profit and loss statement. The modern catalog marketer runs matchback analytics with e-mail getting more priority than catalog marketing, just to understand what the results imply/suggest. The modern catalog marketer executes a post-mortem of every single e-mail marketing campaign, analyzing every item offered in every version of the campaign. Every link in every e-mail campaign is analyzed. The merchandising, inventory, creative, web production team, online marketing team, catalog circulation team, and e-mail marketing teams are all present. The CEO participates on a quarterly basis, if not more often. The modern catalog marketer tests every possible creative treatment, blatantly disregarding established best practices in an endless thirst to discover new and exciting ways to present merchandise. The modern catalog marketer realizes that e-mail marketing is about merchandising and service, not about geeky metrics and tactics. The modern catalog marketer instinctively knows how every single item will perform if offered in an e-mail campaign, and actively shares that information with every employee in the company. The modern catalog marketer "households" e-mail addresses. In other words, the modern catalog marketer will combine kevinh@minethatdata.com and kevin.hillstrom@gmail.com, and evaluates the performance of the all e-mail marketing activities at the "household" level. As you can see, the modern catalog marketer views e-mail very differently than the way the average catalog marketer views e-mail marketing. In the future, mailing catalogs is going to become prohibitively expensive. USPS costs will increase, while the productivity of many housefile customers will decrease due to a proliferation of micro-channels. The business model, as we knew it, is evolving. Therefore, it will become important to execute what I call "rapid segmentation". Immediately after a first purchase, the modern catalog marketer will overlay external purchase data, demographics, web analytics information (referring URLs, pages viewed, prior visits), and the prices/channels/merchandise purchased, to create a "profile" of the first time buyer. The first time buyer will be placed in one of at least three different trajectories. The traditional customer --- the 55+ exurban/rural customer who likes shopping via the telephone. These will be the customers that the catalog marketer speaks to with catalogs. The digital customer --- a "Web 1.0" customer who likes e-mail marketing and search and all the traditional online marketing stuff. Our websites will be calibrated toward these individuals, seeking to maximize conversion among this audience. This segment will receive far fewer catalogs than the traditional customer receives. 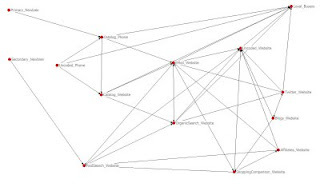 The social shopper --- a "Web 2.0" customer who shops us for very different reasons. This customer will receive few if any catalogs, and we'll be glad to accept whatever profit this customer wants to pass our way. We'll also gladly accept the good will this customer passes our way via social media. Hint --- retail customers, by and large, are social shoppers. It will be critical for us to rapidly segment the new-to-file buyer. Mailing catalogs to customers who don't want them will create negative feedback in the social media world, and will represent a significant waste of marketing dollars. Rapid segmentation will lead to merchandising changes. As the catalogs become a targeted piece to a 55+ exurban/rural telephone shopper, the merchandise assortment will shift to what that audience prefers. Conversely, the digital customer will be "micro-targeted" to with e-mail campaigns and paid search keywords that result in specifically merchandised landing pages. The social shopper will be one where marketing resources are conserved. In many ways, these customers represent the profitable future of the modern catalog marketer. The history of the cataloger has always been about spending large sums of money up-front. The future of the social shopper eliminates all of this waste. Rapid segmentation will be repeated after each subsequent purchase. Customers will move back and forth between segments --- usually moving from traditional direct marketing to social shopping, but occasionally going the other way, that's what makes this fun. Some companies will mine this information internally (hint Williams Sonoma, L.L. Bean, big companies with staff). Some companies will overlay this information from co-ops (hint Abacus, Z24, NextAction, you know who you are). Some companies will overlay web behavior --- using clickstream information to make this decision. Some companies will use all of the information that is available. All modern catalog companies will have to perform this level of segmentation. The most important topic in catalog marketing these days is the death of catalog customer acquisition. For so many folks, catalog customer acquisition productivity (after matchback) declined by an average of 5% to 10% a year, every year, since 2003. Couple that with the dire increases in the cost to mail a catalog (back in 2007), and a huge drop in Fall 2008, and you have a recipe for a death spiral. Catalog customer acquisition has held up when 55+, exurban/rural customers who like shopping via the telephone are targeted. Unfortunately, this audience is in decline, and will not be replaced by younger customers who crave catalog marketing. Modern catalog marketers will be required to diversify. The modern catalog customer acquisition department hosts individuals who specialize in different disciplines. These can be folks hired internally, or may represent folks that work in the vendor community. Traditional catalog customer acquisition managers, the folks who work with Millard or Merit Direct or Abacus. Digital customer acquisition managers, the "Web 1.0" staffers who focus on SEO / SEM / Affiliates / Display Ads / Shopping Comparison Sites, all the stuff we've grown to know and love. Offline customer acquisition managers. The most successful catalog businesses I've worked with have offline programs that do not include catalog marketing. These businesses acquire customers via innovative offline programs --- the customers often have marginal long-term value, but the customers do offset the declines in catalog customer acquisition. Social media managers. I would find your most passionate half-dozen or dozen customer service representatives --- usually found in your call center, and I would unleash them on the social media world --- blogs, Twitter, Facebook, you name it --- have them solve problems and interact with customers and prospects. The catalog companies that have the most robust customer acquisition programs tend to execute two or maybe three of these four areas really well. Average catalogers execute catalog customer acquisition well. I would create a report or dashboard, whatever you want to call it, that tallies the customers acquired via each of these four key areas --- drawing comparisons vs. last month, ytd vs. ly ytd, rolling twelve month periods, etc. The important part of this whole process is diversification. We're going to have to accept a world where we willingly acquire ten customers with $5 LTV, as opposed to prior strategies of focusing on acquiring one customer with $50 LTV. And you folks in the Web Analytics community --- we need your help. The future of customer acquisition requires measurement of a series of activities, all linked together, resulting in an outcome. We'll need to know that a prospect visited the site five times before purchasing --- a process today that is largely measured as a series of failures, but is truly a success. Over the course of the next week, we're going to look at what I call "Modern Catalog Marketing". Last week, I offended the social media community. This week, my loyal catalog readers might not agree with everything (or anything) I have to say. There are so many of us in the catalog industry who strongly believe that the economy will improve, and customers will revert back to a love of shopping via printed images. There are other voices that are worth listening to, traditional voices like Jim Gilbert. And too few of us are supporting the efforts of the American Catalog Mailers Association. We work in a fascinating industry, one where we willingly step all over the rights of our most loyal customers, willingly sharing their name/address with co-ops so that competitors can offer our best customers their merchandise, but we won't share $5,000 to help this organization mitigate future USPS cost increases. We sure like it, however, when they succeed and we save money. I am going to take a different approach than most folks. The traditional catalog folks will work hard to help you maximize your traditional catalog efforts, and that's all good and is needed. I am going to present you with one man's version of "the future", and how we'll navigate our way to this version of the future. Long-term, the USPS is going to offer us less service at a greater cost. Long-term, younger customers in urban/suburban areas will continue to abandon catalog marketing in favor of "shiny new technologies". These two trends will make it prohibitively expensive to acquire new customers via catalog marketing. In many ways, we're almost there. The death of catalog customer acquisition will not be fatal to catalogers. The death of catalog customer acquisition will be very damaging, however, to the catalog vendor community. Housefile direct marketing, as we know it, is evolving. The customer of the future will demand to be contacted on her terms. She will dictate catalog and e-mail marketing frequency. And we'll be fine with that, we'll evolve and change. Traditional catalog marketing, as we've always known it, is trending toward a 55+ aged exurban/rural customer that prefers romance over technology. Housefile direct marketers will expend tremendous energy segmenting customers after a first purchase into a "traditional" path, a "digital" path, or a "social" path. Traditional customers will be marketed to in a traditional sense. Digital customers are the classic "Web 1.0" customer (e-mail, search, display adds, affiliates, shopping comparison sites). Social customers are the emerging "Web 2.0" customer, becoming less and less responsive to marketing. This segmentation strategy will be essential to minimizing expense. Given these trends, every cataloger will be forced to answer a question: Are we in business because we love selling merchandise, or are we in business because we love producing catalogs? It is my belief that those who will survive love selling merchandise. It is my belief that most catalogers love producing catalogs. The businesses that are well-positioned for the future are those that diversify sources of new customers and simulate the long-term impact of all 1-5 year decisions. This week, we'll explore these topics. Your thoughts are welcome, in fact, they're needed. My career has been defined by return on investment (ROI). For the most part, if I did not deliver a significant return on investment for my company, I lost my job. As a consultant, I don't get paid, and I don't get hired if I don't deliver ROI to my clients. As a Statistical Modeler, if my models didn't generate a million dollars of incremental profit, per year, every year, my job was in jeopardy. As a Circulation Director, if my team did not generate a couple million dollars of incremental profit, per year, every year, I'd lose my job. As Vice President of Database Marketing at Nordstrom, if my team did not generate millions of dollars of incremental profit, per year, every year, I'd lose my job. In fact, I had the President of my division call me into his office, back in 2001, telling me that the reason the business was failing was because of my ineptitude, or the ineptitude of the chief merchandising officer. He told me that the merchant or I would lose our job if things didn't improve. Six months later, he lost his job. Eleven months later, the chief merchant lost her job. There are many jobs in a company that require consistent improvement in ROI, in order for the individual to keep his/her job. A merchant's job is measured every single day. The merchant is required to pick the right merchandise, and if customers don't like it, the merchant loses his/her job. In many companies, garden-variety employees get to see how every merchant is performing. The inventory staffer is measured every single day. Have a bad fulfillment rate across the items you are responsible for, and you lose your job. The CEO/President and CFO pay really close attention to how inventory staffers manage the business. Not surprisingly, inventory people get canned when there's too much merchandise and too few customers. The online marketer is measured every single day. Run a terrible paid search program, have display ads that are unprofitable, hook up with affiliates that have a poor reputation, and you lose your job. The e-mail marketer is measured every single day. Every person in the company can watch your performance fluctuate. Sink your productivity from $0.18 per e-mail to $0.14 per e-mail, and you lose your job. What's really sad is that when the e-mail marketer performs really well, the e-mail marketer doesn't get the credit that is deserved. The catalog circulation director is measured every single day. Fail to acquire enough new customers, over-circulate catalogs, or make a circulation mistake (mailing the wrong people), and you lose your job. Up until a few years ago, there were few people more responsible for ROI than the catalog circulation director. The finance staffer is often measured. These folks disperse funds to appropriate projects, and are often measured by Return On Invested Capital. When your finance department screws up, they are fired. Store Managers are actively measured. If your comps are negative, you're finished --- even if the merchants and the marketers screwed everything up. If you are one of these individuals, you go to work every single day with a cloud over your head. You are hyper-accountable. And because you are hyper-accountable, you start to look at other employees in your company. There are many employees who are paid what you are paid, or are even paid more than you for a comparable skill level. These employees are important, needed individuals. But the metrics aren't always in place to determine return on investment. How would you measure the return on investment in these cases? Catalog or Internet Photography: How do you know when you have a creative staffer who has "an eye" for the right way to present merchandise? At least photography can be tested. But you won't find a dashboard in your company that measures the sales generated by your creative people, will you? Information Technology: Under what circumstances does the IT staffer hurt the business to the point where all employees are suffering? How would you measure it? Even worse, most employees are aware that IT employees are paid on a different wage scale (i.e. more) than are employees who are directly accountable for generating sales. You won't find a dashboard in your company that points to the IT staffers who generated the most sales. Sure, IT folks can miss deadlines and make mistakes ... but that happens with all employees. So what metrics do you look to in order to correlate sales generated by an IT staffer? Social Media: A growing contingent of social media experts are suggesting that you don't measure ROI in a traditional manner in social media, just read the Social Media SmartBrief or some of the top 25 Social Media bloggers to review the arguments. If you're one of the marketers who are actively measured on a daily basis, you're not always thrilled with your co-workers who Twitter and blog all day long and then suggest they shouldn't be measured the same way that, say, an e-mail marketer is measured. But you need these people, you need pioneers who are taking a westbound path on the Oregon Trail, right? So what are the metrics used to evaluate the pioneer? Offline Marketing: How do you measure the ROI of a newspaper ad, a billboard, radio, television, sponsorship? Not surprisingly, these are the programs that are the first to be cut in economic downturns ... but that isn't deserved either, just because it is hard to measure. Many of these programs can be tested, but aren't. Human Resources: How do you measure the return on investment of an HR staffer who is able to arbitrate arguments between employees? You really can't "test" HR staffer effectiveness to identify what impact that has on company sales, can you? Copywriter: In so many companies, copy evaluation is subjective. But it matters. At least copy can be tested, and in paid search, it is actively tested. The Business Intelligence movement yielded three classes of employees. Employees where the relationship to sales can be easily and directly measured. Employees where the relationship to sales can be inferred via periphery metrics and testing. Employees where the relationship to sales cannot be measured. If you can possibly become an employee who is measured on a daily basis, become that person. Those who are measured tend to rise to leadership positions within companies --- you see merchants running companies, you see finance folks running companies. Whether for good or bad, you don't see as many folks who aren't directly accountable for sales in leadership positions. And if your area of responsibility can be measured via periphery metrics, by all means, identify every single periphery metric you can, and prove that you're moving the needle on something. Finally, if you are one of the employees who love working in areas that are not directly accountable for sales, that's not your fault --- you need to do what love, right? So how does an organization evaluate your performance in a fair comparison to folks who are directly accountable for sales generation? For traditional direct marketers, there is no single metric that is more important to calculate than the organic percentage. Simply put, the organic percentage is the percentage of demand that is generated independent of marketing activities. For many catalogers, the percentage is calculated as the percentage of demand that is independent of catalog marketing. We care about this, of course, because our matchback analytics frequently attribute orders to catalog and e-mail marketing activities, orders that would have happened regardless of any catalog or e-mail marketing. Catalog marketers are growing comfortable with this percentage, because of the actionable ways it gets put into use. Organic percentages of maybe 10% suggest that your catalog is the reason your business exists! Organic percentages of maybe 35% to 40% suggest a considerable amount of over-mailing. These businesses are probably attributing too much business to catalogs and direct marketing in their matchback algorithms. Organic percentages of 80% or more suggest a powerful brand that is complemented by direct marketing, not driven by direct marketing. For my catalog readers out there, work closely with your co-op or other matchback provider, calculating this important percentage. If that number creeps up over 30%, it is time for serious catalog contact strategy testing. For my online marketing readers out there, this is another good place to partner with a Coremetrics, Omniture, or Unica, folks who can help you get to the bottom of this important metric. When we evaluate how customers are migrating between micro-channels, we need to calculate migration modes for each micro-channel. Here's how we do that. Step 1: Take a calendar year (2007), or any twelve month period of time. Create an indicator (1 = yes, 0 = no) whether the customer purchased from a micro-channel during that timeframe. Step 2: Take the next calendar year (2008), or any subsequent twelve month period of time. Create the same set of indicators (1 = yes, 0 = no). Step 3: Take any one indicator in Step 1 (say the customer purchased because of Google Paid Search), and store those customers in a file. Step 4: For all customers in Step 3, calculate the percentage of customers who. Purchased in the dataset in Step 2. Purchased from any of the indicators in the dataset in Step 2. Step 5: For each of the indicators in Step 4, take the percentage buying from an indicator, and divide it by the total repurchase rate. Step 6: Classify each index on the basis of the following criteria. Isolation Mode = An index between 0.00 and 0.20. Equilibrium Mode = An index between 0.20 and 0.50. Transfer Mode = An index greater than 0.50. Isolation Mode is important, because it happens when a customer becomes loyal to a product, brand, or channel. I see this all the time with Google. Yahoo! and MSN searchers are in Equilibrium Mode with Google, but Google searchers are in Isolation Mode with Yahoo! and MSN. In other words, once the customer becomes loyal to Google, the customer stays with Google. Equilibrium Mode is where all of the subtleties of a business happen. In social media, we've seen the slow leak from blogging to micro-blogging, as users migrate away from blogs to their own Twitter page. For catalogers, there has been a decade-long leak from customers ordering over the telephone to customers ordering via websites. For online channels within retailers, you'll see that customers rarely stay loyal to the online channel ... often, the customer slowly leaks back to the retail channel. Transfer Mode happens when there is a mass exodus from a product, brand, or channel to another product, brand or channel. Work with the good folks at Coremetrics or Omniture to have these metrics generated for you, there's no reason they cannot calculate these metrics, at a micro-channel level, to assist you in understanding how customers are interacting with micro-channels. For you catalogers who partner with Unica, they certainly have the skills necessary to do this, just ask them! And for those of you lucky enough to have a SQL/SAS/SPSS programmer, this is brutally easy to do! For those of you who provide services for B2C and B2B companies, you may be noticing significant shifts in how your blog interacts with the world. March 2006 = 25 Subscribers, 25 Daily Visitors (10 From Blogs, 10 From Google). March 2007 = 300 Subscribers, 100 Daily Visitors (40 From Blogs, 50 From Google). March 2008 = 1,000 Subscribers, 250 Daily Visitors (30 From Blogs, 175 From Google). March 2009 = 1,700 Subscribers, 125 Daily Visitors (30 From Twitter, 7 From Facebook, 50 From Google, 20 From Blogs), 400 Twitter Followers. Major change in Google algorithm in February cuts search traffic by 65%. For the individual/company trying to provide services for the B2C / B2B audience, this represents a big shift in how folks are consuming information. We keep telling the companies that we work with how the world is changing, how they must adapt to a changing world. Well, how about us? Are we adapting to the changing world? Dependence on Twitter results in a lack of "link love" that fuels Google's view of your online presence. As a result, your Google "page rank" or modern equivalent if you will, doesn't grow at the same rate, and therefore, organic search becomes less effective, making it harder to develop an audience. Twitter, at 140 characters, makes it harder for the marketer to explain topics with any level of depth, and hence, makes it harder to develop credibility on deep topics. Twitter, adopted by 2 of every 100 folks in the United States, limits our ability to speak to the audience we wish to speak to. I'm lucky if 10 of my 400 Twitter followers would ever hire me for my consulting practice. At this time, Twitter is important for experimentation, but it is dangerous to depend upon it as a marketing channel. Word of mouth becomes more and more important ... we'll all need folks talking about us online and offline to fuel growth. Times are changing ... for everybody. I'm curious to see how those of us who advise clients are evolving and adapting? Care to share? This is a mega-metric that almost nobody is tracking. And yet, this metric is our future. We calculate Annual Micro-Channels purchased from by identifying the number of twelve month buyers, then summing the total number of unique micro-channel combinations the customer purchases from. Micro-channels are a combination of the referring URL and the physical channel the customer purchased from. Referring URLs are usually summarized --- for instance, at Nordstrom, back in 2006, we combined all blogs, calling all of them one "micro-channel". There are two trends we need to follow. 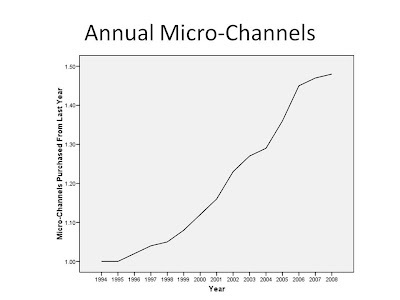 First, there is an explosion of micro-channels, and if your business is not seeing customers purchasing from multiple micro-channels, it may mean that your customers are either unwilling to shop multiple micro-channels, or that you are not taking advantage of the veritable plethora of micro-channels that now exist. Second, the shift in micro-channel behavior has never been faster. So this becomes really important. If you see stagnant growth in micro-channels purchased from, but a huge shift in micro-channel behavior (customers who used to use Google now use Twitter), then you have huge micro-channel cannibalization happening. Micro-channel cannibalization is rampant on this blog. Three years ago, all of my visitors came from other blogs. Eighteen months ago, it was a combination of subscribers and Google juice. Today, visitors are a combination of subscribers, much less Google juice, and many more visitors from Twitter. There is no doubt that Twitter utterly cannibalized blog visitors, and is now in the embryonic stages of cannibalizing Google searchers. These trends are happening, in real-time, on your e-commerce website. You'll want to measure annual micro-channels purchased from, and you'll want to use Multichannel Forensics to measure how customers are migrating between micro-channels. You'll want to work with the good folks at Coremetrics or Omniture to calibrate this (and all) mega-metrics. 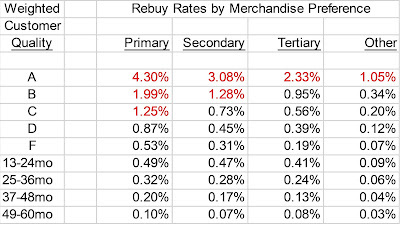 In my opinion, the most important mega-metric is the Repurchase Rate. 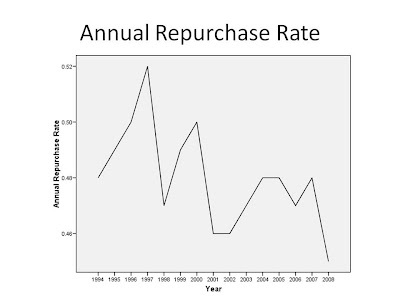 Repurchase Rate is the single most important indicator of customer loyalty. We calculate repurchase rate by dividing our database into two time periods. We identify all customers who purchased during, say, 2007. Then, we calculate the percentage of 2007 customers who purchased again during 2008. In Multichannel Forensics, we divide the annual repurchase rate into three categories. Retention Mode: Annual Repurchase Rate > 60%. Hybrid Mode: Annual Repurchase Rate between 40% and 60%. Acquisition Mode: Annual Repurchase Rate less than 40%. When I worked at Nordstrom, we were largely in Retention Mode ... our store customers loved us. We were able to retain more than 70% of our store customers, year-over-year. When I worked at Eddie Bauer, we were largely in Hybrid Mode ... we retained between 40% and 60% of our customers, year-over-year. Hybrid Mode is the most enjoyable business model to work in, because you have so many levers to improve business success. At Nordstrom, you weren't going to improve the retention rate from 76% to 91%, it simply wasn't mathematically possible. But in Hybrid Mode, you can make a difference! When I worked at Eddie Bauer, we had a Home division. That division was in Acquisition Mode, with an annual repurchase rate under 40%. The only way this business was going to grow was by acquiring new customers at a faster and more profitable rate than last year, period. You simply cannot get a customer who just purchased a couch to buy another couch! During my time at Eddie Bauer, we were only able to get the Home division close to break-even once --- and during that year, we did that by renting the entire Pottery Barn list, over and over and over. We mailed more Pottery Barn names than we mailed Eddie Bauer names ... at least that's the way I remember it! Acquisition Mode is the least understood by direct marketers, and it is a scenario that is about to become a really big deal to online marketers. You see, so many of the folks working in the online channel manage an "Acquisition Mode" business. As mentioned earlier, these channels/businesses succeed when new customers are increased at a profitable rate, year-over-year. Thanks to Google and offline cannibalization, this was easy to do, year-after-year. A generation of online marketers grew their business without the hand-to-hand combat other channel leaders had to deal with. In 2009, the easy flow of new customers, courtesy of Google or offline channels, is ending. This is where things get really interesting, folks. If your online channel is in Acquisition Mode, and an easy flow of new customers from other channels or Google is drying up, you have challenges in front of you. So be sure to measure your annual retention rate right now --- it is so easy to do!! Understand the dynamics of your business, and begin to plan for the consequences of your business model. "Hi Kevin, I'm the CEO of 'BRAND-X' and am a big fan of the blog, keep up the good work! I have a few questions for you. We've always believed that our catalog is our business. We generate 75% of our online business because a catalog was mailed to a customer in the three weeks prior to an online order. We believe that we've maxed-out our paid search opportunity. We don't believe that display ads are the answer. In fact, we're not convinced online marketing is the answer, the genre doesn't scale, and the customers we acquire online are worth just half of what offline customers are worth. We e-mail our customer file six times a month, and yield a paltry $0.14 per e-mail --- great ROI, but no opportunity to drive real sales growth ... and if we do a highly targeted and trigger-based program we get, what, $0.22 per e-mail? It doesn't scale. We think social media is nothing more than hype --- we have a Twitter presence and Facebook presence and MySpace presence and we have a Blog, all of which generate maybe $2,000 of sales a year ... lots of buzz and word of mouth and employees spending time Twittering when they could be generating business for me ... it simply isn't scalable today. We have a mobile website that is lucky to garner 1,500 visitors a month at a 3% conversion rate. Kevin, we see the writing on the wall ... the productivity of our catalog customer acquisition activities via list rental and co-op participation are down 40% from where they were back in 2004. So if none of the other stuff "works", if you will, and we cannot drive new customer acquisition with catalogs, how do you propose we map out a route to the future? Even more important, how do we create demand if the primary vehicle for creating demand is being marginalized? I mean, you say you killed a catalog program at Nordstrom and grew sales, but Nordstrom can get away with that because they have a retail presence ... we don't, so their strategy just won't work for us. Thanks, and I look forward to reviewing your comments." Notice that this is a leading question, logical, but leading. The individual asking the question is leading the reader to a pre-destined conclusion --- that nothing new is going to work so therefore the answer lies in improving how traditional catalog marketing is executed --- we just have to work harder, right? Now give me the five easy steps for making that happen! If you continue to have a discussion with this individual, you'll spend time talking about how to maximize page counts, how to rearrange in-home dates, how to get Abacus to produce a better model for free, how to front-load the catalog with "winners", how to get the circulation director to target only the best customers, how to co-mail catalogs with indirect competitors, a discussion about whether to have $12.95 shipping or $14.95 shipping, how to get better printing efficiencies that result in cost savings, how to spend less with merge/purge vendors, how to continue to achieve improvements in paper cost, a discussion about dots on the cover of the catalog calling out new products ... in other words, you'll have a discussion about tactics, not a strategic discussion about the business model. The real question is about "the business model". What is the business model that replaces the business model I've managed for the past twenty or thirty years? Business leaders are disappointed when I tell them that the answer to their question is " ... there is no business model that replaces the business model you've worked in for the past twenty or thirty years." If you disagree with that answer, give Clay Shirky's essay about the newspaper industry a read. Seriously, if a replacement business model existed, wouldn't everybody be doing it right now? Wouldn't it be so obvious that the transition to the future would be easy and self-evident? Now to be fair, there are companies that use a direct-to-consumer business model that is very different than cataloging, and they are growing sales. You're already familiar with the stars ... Amazon and Zappos, for instance. The fact that Zappos will sell more shoes online in five years than Nordstrom sells across all channels should make any business leader sit up and take notice. Those businesses, however, had the luxury of building a path to the future from scratch. 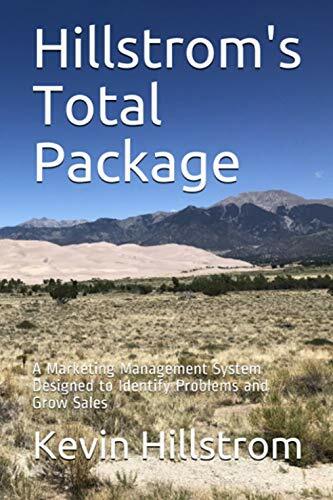 Your catalog business is different --- for you, it is like a NASCAR team executing a pit stop for four tires and fuel and a spring adjustment while still racing around the track at 190mph. The danger for a NASCAR team is that if a pit stop happens under green flag conditions, the team will likely lose a lap to the competition, and will not be able to gain the lap back. The danger for the catalog brand is that if a serious effort at re-inventing the business happens, the business may see a 50% sales decline, and may not be able to gain the business back once the new business model is in place (should Multichannel Forensics work suggest this is the outcome). The real question, then, is the sustainability of the business model. At what point does catalog customer acquisition become so bad that we are forced to experiment, forced to try two-hundred micro-channels hoping that seven will lead us to the future? At what point do we decide to find three online customers with a lifetime value of $10 each instead of one catalog customer with a lifetime value of $30? At what point is it worth investing the time and money to figure out how to create demand online? 2003 - 2007 was the time, because we had the luxury to test back then, given the comparatively healthy nature of the economy. 2009 - 2010 is a good time, too, simply because of the economics of our current environment. I wouldn't wait much longer. Your thoughts? Do you empathize with the CEO mentioned eariler? What do you think is the path to the future? Or is catalog marketing simply in a slump that will go away when the economy improves and customers again trust catalogs in mailboxes from companies they've never purchased from? Oh those online marketers ... looking to attribute orders to the right marketing channel. Allocation / Attribution is a largely futile effort. We simply cannot get in the mind of the customer, can we? We can test. Testing works really well in the direct marketing world, but testing for attribution purposes works less well in the online marketing world. So here's what you can try ... I've had success with this. Create what I would call "combinations". When a customer visits your site on March 3 via paid search, and purchases on March 5 via an e-mail campaign, you create a "combination" that captures the first touch and the last touch. In this case, the combination is "PAID SEARCH / E-MAIL". If the customer only had one visit (say from an affiliate marketer), then the combination is "AFFILIATE ONLY". The pundits will jump in and suggest that we're missing everything that happens in-between first touch and last touch. Let them jump in and argue. Pay CLOSE ATTENTION to what happens on the next purchase. What are the combinations that are most likely to happen NEXT? Does "PAID SEARCH / E-MAIL" lead to "E-MAIL / PAID SEARCH"? Or does it lead to "PAID SEARCH / E-MAIL"? Or does it lead to "ORGANIC ONLY"? The mega-metric to calculate is the percentage of folks who migrate to different combinations in the future. We care about what happens next, because what happens next tends to dictate what the primary driver is. Over time, you'll learn that certain advertising channels tend to "drive" orders, while other advertising channels tend to "complement" orders. Once you identify the channels that drive orders, you begin to understand how you might attribute orders to ad channels better --- and you'll make better investment decisions. The combinations help you see how customers migrate over time ... helping you figure out "what to do next" as opposed to helping you figure out "what just happened". Ultimately, you'll plug the most popular combinations into a Multichannel Forensics simulation, and you'll see what is about to happen to the future trajectory of your business. Almost all of us have analyzed the results of marketing activities via the "conversion rate". The online industry is fueled by conversions. Directionally, the metric works. And yet, the metric is fundamentally wrong. At Nordstrom, we analyzed our multichannel shoppers to death. We knew the following happened, on a monthly basis --- called the "3-2-1" rule. The multichannel shopper visited our website three times a month. The multichannel shopper visited at least one store two times a month. The multichannel shopper purchased one time a month, usually in a store. An online conversion rate is woefully inadequate when measuring this type of behavior. So is shopping cart abandonment. All we really care about is that, over a period of time, did the customer buy from us? We don't care how the customer got to the end result --- we only care about the end result!! With that in mind, conversion rates and shopping cart abandonment rates are feckless --- they simply do not measure how customers actually behaved. While still flawed, we evaluated a "Monthly Conversion Rate". Take all customers who visited your website in the past month. Of those visitors, what percentage purchased something, in any channel? Divide monthly purchasers by unique monthly visitors. Now some of you will send me e-mail messages and leave anonymous comments, nitpicking the fact that I forgot to think about concepts "A", "B" and "C". And you'll keep using conversion rate as your favorite metric. Life is richer when individuals have different ideas for solving problems. What is important is the business intelligence you gain from a monthly conversion rate. All of a sudden, you realize that your conversion rate isn't a measly 4.398541842304%. Instead, your website facilitates a monthly conversion rate of 37% across all channels. Heck, you're not the failure that the vendor community portrays you to be!!!!!!! You're actually more successful than you thought. That's not a bad thing. So instead of beating me up over all the reasons this metric is wrong, work with your BI team, or with Coremetrics/Omniture to create this metric, and start enhancing the way you evaluate your business --- pick a different timeframe or metric --- just do something to advance your industry!